TRANSFORM THE EVERY DAY WALKING ROUTINE IN AN ADVENTURE WITH CHUNKY PAW HANDS FREE DOG LEASH! Our dog leash gives you the hands free freedom, while walking or running you can hold a water bottle, check out new feeds, chat on your smartphone or push the baby stroller. -The waist belt is adjustable from 27" to 48" and designed with a safety mechanism that prevents the belt unlatching. -The elastic bungee is built in and absorbs the shock and protects you and your pup from injuries. -Two ways to use: you can switch from the hands free mode quickly to hands on mode and use is like a traditional leash. 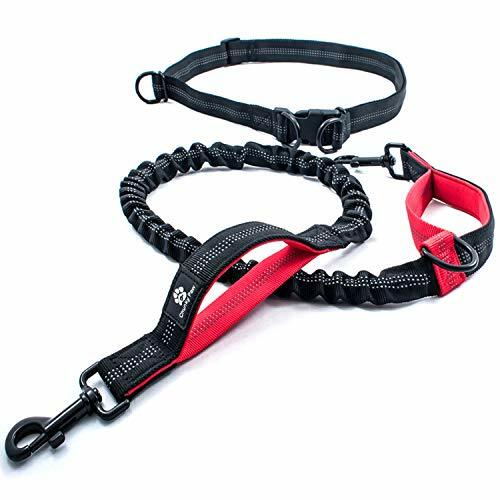 -On the leash you will find two raised up handles, that are very easy to grab and comfortable to your hands owing to the soft, padded neoprene material. -The three seams of luminous reflective stitching will hep you run or walk even when is dark outside. -The original design of our leash includes two handles for extra control, which helps you in all kind of situations. -The leash length gives your dog enough space to explore the surroundings or run with you, but not too long to pull it on the ground. -The stainless steel claps and rings are made of high quality materials which are durable for years. SAFETY TO YOUR DOG: Enjoy hands free dog leash while your pup is totally safe. Our product has been built with a security mechanism to prevent the unlinking of the belt which is equipped with two stainless steel rings to reduce the tension of the plastic buckle, so you will never have to worry about your dog breaking free. PADDED RAISED UP HANDLES: Unlike other leashes that can hurt your hands, Chunky Paw hands free leash has two soft and durable neoprene handles, which are comfortable and very easy to grab thanks to raised up handles. HANDS FREE OR HANDS ON: Our hands free leash offers two choices to use it. You can switch from the hands free mode quickly to hands on mode, and use is like a traditional leash. DUAL HANDLE FOR EXCELLENT CONTROL: Guide your pup smoothly holding the waist handle, reducing the tension on the leash by the elastic bungee. Or if you want to have a firm control of your dog, in unexpected situations you can easily grab the raised up collar handle. PERFECT GIFT FOR DOG OWNER: Chunky Paw hands free dog leash is the best choice for active mothers, athletes, active seniors or anyone who wants their hands free. Suitable for running, training, hiking, jogging, walking with your dog. If you have any questions about this product by Chunky Paw, contact us by completing and submitting the form below. If you are looking for a specif part number, please include it with your message.